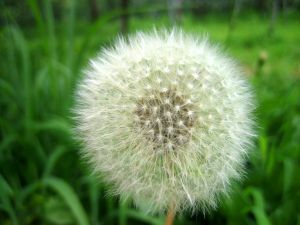 Taraxacum dens Leonis. No plant is better known than this. From its effects it has been called by country people, Piss-a-bed. The leaves and root are bitter, and contain a bitter milky juice. It is of an opening and cleansing quality, and therefore very effectual for obstructions of the liver, gall and spleen, and the diseases that arise from them, as the jaundice and hypochondriasis; Dandelion opens the passages of the urine both in young and old; powerfully cleanses imposthumes and inward ulcers in the urinary passage, and by its drying and temperate quality heals them; for which purpose the decoction of the roots or leaves in white wine, is very effectual. In progressing consumption, or in an evil disposition of the whole body, called Cachexy, by the use of Dandelion great relief will be obtained. It promotes rest and sleep to bodies distempered by the heat of ague fits or otherwise. The Dandelion therefore is a most useful herb, and ought to be more extensively known, on account of its tonic, alterative, diaphoretic, and diuretic properties. It is as valuable as Sarsaparilla, and is often given in dyspepsia, dropsy, cutaneous eruptions, and chachectic disorders generally. A decoction is made of the fresh root sliced, 1 ounce to a pint of water, boil down to half a pint, and strain, adding 2 drachms of Cream of Tartar, and take a wine glassful twice or thrice a day. Physicians generally order the extract prepared thus;�obtain the juice from the root by pressure, and then evaporate till it is a little thicker than treacle�the dose is from 10 grains to half a drachm. The French use the leaves in Salad, and the Germans roast the root for Coffee.